Focus: MelissaMelissa - It’s love! Love at second sight, perhaps, but even so, it’s a love that takes over all the senses. 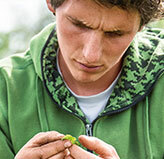 Planting, cultivating and harvesting melissa for Dr. Hauschka Skin Care. With its fine, silvery hairs, blue, star-shaped petals, and its powerful arms, borage almost seems to come from another world. A blue shimmer is all around us. We are in the biodynamic plant garden. Focus: Revitalising Leg & Arm Tonic Revitalising Leg & Arm Tonic: Turned upside down! For wonderfully light legs like after doing a headstand. Delicate petals above bristly leaves – Potentilla officinalis seems to embrace polarities. Even Hippocrates knew that Potentilla officinalis had a multitude of uses to the body. 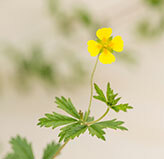 Acute Care Potentilla is a soothing skin care product. 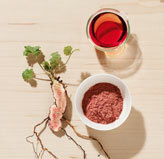 This tea is not only popular as a stimulating drink, though; it is also a sought-after cosmetic ingredient. 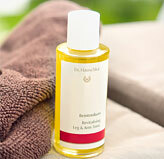 An interview with Marie Calas, Head of Skin Care Development at Dr. Hauschka. 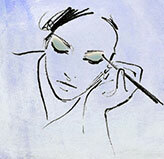 Charm onlookers with our Eyeshadows.